Let’s cut to the chase. 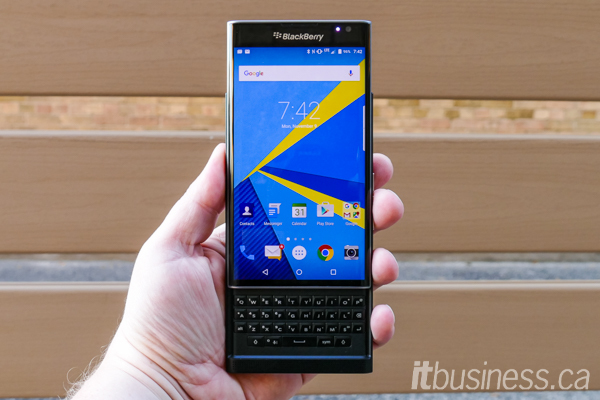 The Priv is everything a BlackBerry user wanted it to be and more. It has all the great features and battery life that make the BlackBerry beloved by road warriors. It’s got the focus on security that BlackBerry is famous for. It gives you access to all of the apps that you need to do your work as well as the lifestyle apps that you want to have and use. It can do anything that a top of the line Android phone can do – and maybe a little more. I’m still running through all my apps but so far no issues at all. And now, the whole Google Play Store is open to you. I’ve been looking forward to this since I heard the first rumours about BlackBerry coming out with an Android phone. A few days ago I got my review device by courier. When I opened it, the first words out of my mouth were, “It’s freaking gorgeous.” And it is. You can love your iPhone, your Samsung or whatever – but this phone is as beautifully designed as any of them. The Priv is surprisingly slim and elegant, yet it feels substantial and rugged in your hand. When you drop a phone as much as I do elegant is nice, but rugged is what counts. It has a physical keyboard that slides out effortlessly so there is a full sized screen touch screen. In other words, the best of BlackBerry is combined with the best of every Android phone. Add in a long life battery, great security, extendible storage and a truly fabulous camera and you have the Priv. If you are a BlackBerry user who is tired of having people rag you about your choice of phone, you have my permission to stop reading now and go and order a Priv now. If you aren’t – read on. You might want to know what you are missing. I’m not sure how they did it. I have very large hands which are great for guitar but lousy for phones. 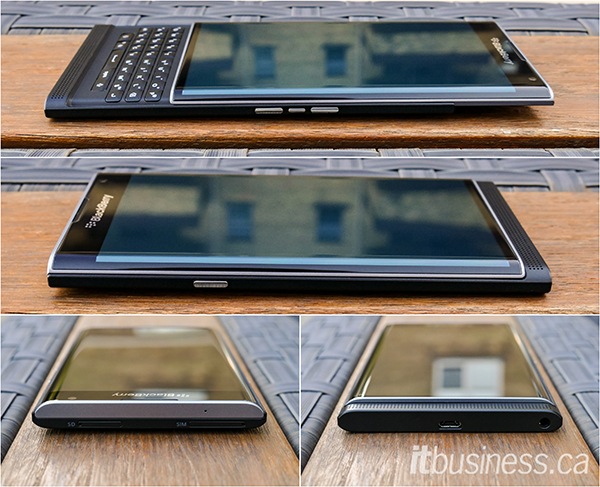 I liked the bigger keyboard on the PassPort. The Priv has a much smaller keyboard and it feels a little strange at first. Despite my thick fingers, I was up to speed “thumb typing” in no time at all. For quick entries, you can use the touch screen keyboard. It disappears when you open the physical keyboard. Both the physical and the touch screen keyboards have what I’ve called the “suggestion engine” that I first saw on the Leap. This allows you to select words that are not just type ahead suggestions but attempts to predict the next words that you might type in that context. If that isn’t enough, because this is now a true Android device, you can use Google’s exceptional voice recognition. Even though I’m a pretty good typist, I made more mistakes typing this paragraph than Google’s voice recognition made when I dictated it. I only had to correct one thing. Google can’t spell Priv. Not yet anyway. 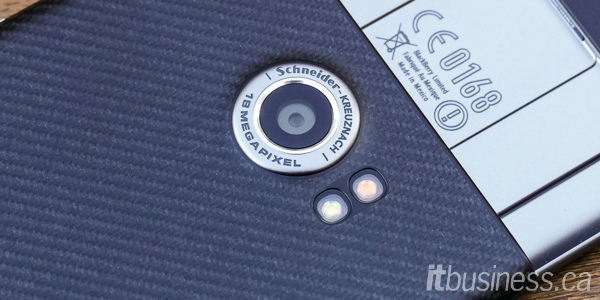 The 18-megapixel camera with autofocus is amazing. Compared to 16 for the Note 5 and 12 megapixels for the iPhone 6 it’s top of the line. I’m the world’s lousiest photographer so I won’t show you my examples. I use the camera to scan things and to take screen shots or to grab something to make twitter messages a little more interesting. That’s my usual limit. But look at the video below that I shot with the Priv. IT was done in an awful room with lousy florescent lighting and I’d had the phone for less that 24 hours at this point. Despite the fact that it’s a concrete pit where people kept coming in and making noise, the sound isn’t too bad at all. If I can do this with no talent, someone who actually knows how to take a photo might find this 4k video camera truly amazing. And though I have little attention to composition, the stills from the Priv are outstanding. I have to take the BlackBerry techs at their word on how they’ve built the stack to keep the Priv secure at boot. Data on the phone is fully encrypted by default. But the real quesiton for all of us is not whether you can you make a device secure. It’s “can you trust the Android apps?” If the horror stories which are part truth and part urban legend don’t make you paranoid try reading all of the things that an Android app wants to access on your phone. It will make you cringe. So BlackBerry came up with DTEK which is part detection and part social engineering. It inspects your device over a number of facets – hardware, encryption, OS, remote management, your choice of screen lock (there are several) and, of course, all the apps you’ve loaded. It will rate you on from poor to excellent and give you tips on how to improve your device security. Forget what permissions the apps ask for. After all, have you ever said no? DTEK focuses on what permissions the apps actually use. If you are like me, you wonder why apps have to ask for access to every facet of your device. You may be afraid to block them, or not quite comfortable giving out that access. Or like most of the world, you might do what drives security people crazy. You just click yes and move on. DTEK solves this problem. For each app, it shows not what they ask for, but what the apps actually use. I loaded some random games, Facebook messenger and others – I was surprised that while these apps wanted access to a number of things, they seem to use very few of them. I purposely picked names like “Zombie World War” hoping to see some activity. Nothing much happened. Linked In, on other hand, accessed 7 contacts. Twitter only looked at one contact but checked location 152 times. When I last checked, Skype had gone through over 3,000 contacts and was giving me a red line warning for this activity. You don’t have to watch each app – DTEK does it for you. You can set alarms on apps that you want to watch and see what type of access they are using. I just spent two days at a security conference talking about this as a state of the art way to look at security – watch for unusual behaviours in apps. DTEK does this for you. This can lead to greater peace of mind, but it may also lead to app developers cleaning up their act or at least sharing with us what it is that they are gathering from us. If it causes you to question and maybe clean up apps – that’s a good thing. Negatives on Security? What is it with the number picture thing? The only thing I didn’t like on security? The picture and number combination for security didn’t work for me that well. I’m not sure how, but I got to 7 attempts – remembering that at 10 unsuccessful attempts, the BlackBerry will delete all data and reset. I don’t know if it’s me or the device, but 7 out of 10 is cutting it too fine for me. I want something that works every time. But, as I found out in DTEK, a PIN offers superior protection. I just keep discovering more and more ways that I can increase productivity and I thought I knew most of them. There are all of the things that came over from BB10 like the Hub and Blend. For those who don’t know, the Hub takes all your messaging accounts – mail, social media, text and even phone – and puts them into one place. You might think you have something similar on iPhone or Android, but the Hub is a step up from the best of these. I have four email accounts, several different social media accounts and I use text a lot. This allows me to stay on top of it all and not miss anything. Of course, if I want to isolate any one account – it’s easy. There’s a huge number of productivity shortcuts. Some are from BB10 and some are new to the Priv. I’ll do a shout-out to a couple of my favourites but if I listed them all, this review would be even longer. I promise I’m going to do a series of tips over the next few weeks – so please send me yours. BlackBerry finally made sense out of widgets – something I never really got to use on any other Android device. If you change one setting, any app with a widget has three dots. Swipe these and the available widgets appear. This is radically better than devoting the amount of home screen space that Android widgets need on other phones. Do you hate scrolling on a touch screen because you always end up activating something while all you are trying to do is move up or down? On the Priv you can swipe on the keyboard and scroll effortlessly – and accurately. 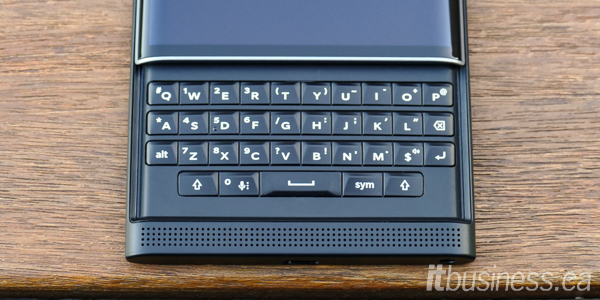 Keyboard shortcuts, a BlackBerry signature item, allow you to navigate quickly and accurately. From “T” for top and “B” for bottom, and a host of others, you can do move around much more quickly that trying to navigate a touch screen. Of course, with the full touch screen available to you, if you feel better doing that- go for it. The great thing about this design is that you have choices. You can do what is the most effective for YOU in a particular context. Why do I care about storage on a phone? Why not use the cloud? Well even with a big data plan – I shot a hi-def video that was a half a gigabyte. I don’t want that loading up to the cloud even with my data plan. When I was at the Gartner event in November I used up my US data plan in a couple of days even when I was trying to use wi-fi. I’m still waiting to see the bill from a recent trip to Europe. And until they get wi-fi on Canadian planes, I have to take some files on my phone. Or I can pull out my laptop and hope to not get my screen crushed by the guy ahead of me. Even with the cloud – there are times when you want to carry data on your phone. Fortunately, the Priv has lots of room for data – you can add a micro SD card to take you well over a 100 GB capacity. All the music, all the videos and even all the work files you want will probably fit. If you want to do this on IoS you end up spending close to $1,300 CDN. With the Note 5 to my surprise, you can’t add an SD card either now. But the BlackBerry still allows you a cheap and easy way to have an incredible amount of storage space. I only use one phone if I can help it. So sound quality is essential. I’ve read what BlackBerry says about it’s speakers and microphones – but every phone has a great story. So this is not a technical opinion. All I know is when I’m a using a BlackBerry – including the Priv – on a speaker phone, in the car or just making a call, I don’t get complaints or have people constantly say, “what was that?” And I hear better. 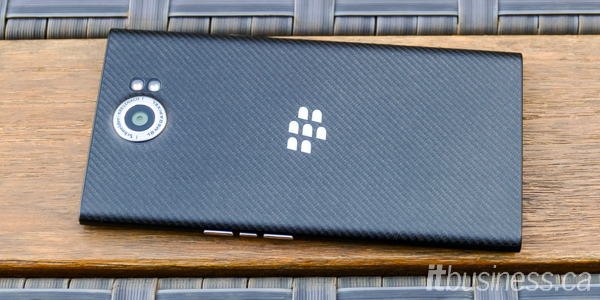 Availability & Pricing Unlocked from BlackBerry, CrackBerry and NCIX. Carriers: Bell, Eastlink, Rogers, SaskTel, Telus, Wind Mobile. $899 CDN outright, starting at $400 on a 2-year term. Okay, I’ve raved about this phone. I’m sure that over time, I’ll find some things that could be improved. I’ve only had it a couple of days. And yes, I like BlackBerry. But I own a Samsung, an iPhone, a Passport and I almost bought a Nexxus too. There are great things that I like about all of them. But dollar for dollar, if you have to use your phone to be productive and secure, for a first edition phone the Priv is pretty amazing. I know it’s fashionable to make fun of BlackBerries these days. And if you really care about that, you stopped reading long ago. But if you keep an open mind, check it out and try it for yourself. If you need your phone to do business but you want your phone to have the latest consumer apps – this may be the droid you are looking for.